For more substantial fare, try the combination of Southern and Cajun flavors that guide the menu at The French Market & Tavern. Rich desserts, fresh coffee and creatively mixed cocktails round out the restaurant’s offerings; home goods found in the market provide added appeal (3840 GA-42, Locust Grove, GA 30248; http://FrenchMarketTavern.com). 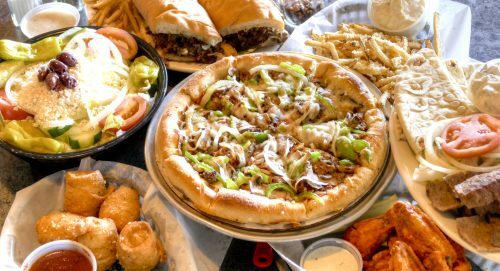 With a variety of options that include pizza, traditional Greek fare, vegan and allergy-friendly options, Graffiti’s Pizza-A Greek Taverna offers foods that will satisfy a range of palates. Recognizing the need for allergy and meat-free alternatives, the restaurant fashioned a dedicated menu for diners with dietary restrictions (1170 GA-155 S, McDonough, GA 30253; www.GraffitisPizzaMcdonough.com/vegan-variety-vegan-vegetarian-dairy-free). Starting south of downtown Atlanta in Henry County, coffee, donuts and desserts take center stage. Drip-Thru Coffee was inspired by tiny coffee shops in the Northwest. Owner Christy Deen serves locally-sourced, organic coffee, smoothies, tea and grab-and-go snacks (50 GA-138, Stockbridge, GA 30281; www.DripThruCoffee.com). 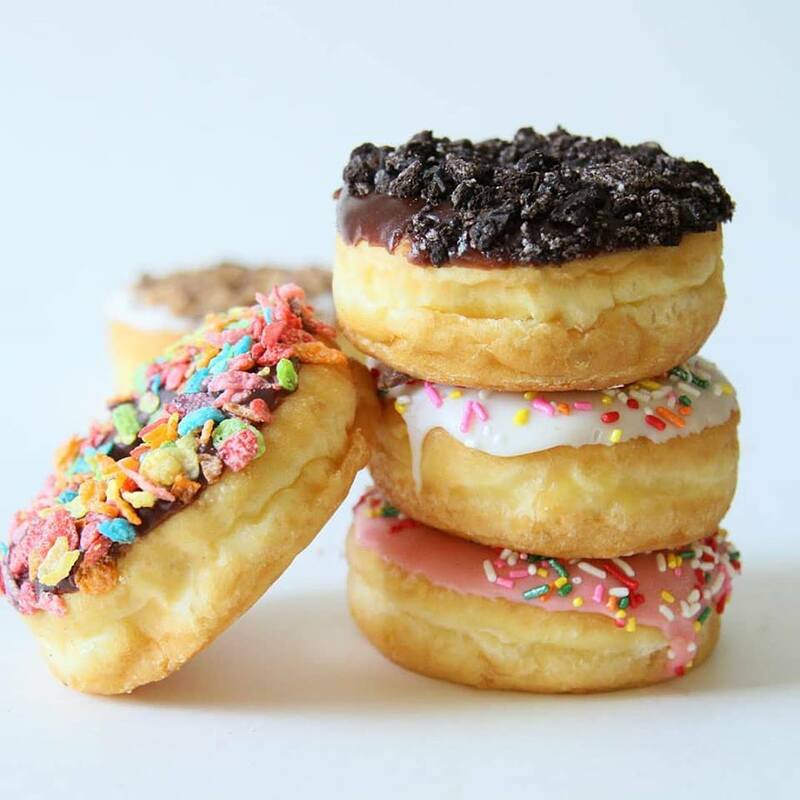 Get a to-go cup and head over to Holey Sweet Donuts, where the gourmet doughnuts range in flavor from classic glazed to unexpected toppings such as maple bacon. The sweet, often colorful offerings are popular among patrons (90 GA-138 b, Stockbridge, GA 30281; www.HoleySweetDonuts.com). The brain child of Food Network’s “Christmas Cookie Challenge” winner Nicole Silva, Crumbles creates mouthwatering custom desserts that include everything from paint-your-own cookies to monster milkshakes and gluten-free cakes (3988 GA-42, Locust Grove, GA 30248; www.CrumblesbyNicole.com). In the sprawling countryside near Douglasville, The Paddock Restaurant at Foxhall Resort is a rustic, farm-to-table restaurant overlooking immaculate polo fields. Warm Georgia pine and stacked stone set the stage for a relaxed yet refined dining experience indoors and out. The menu pairs the season’s freshest locally-sourced vegetables with such items as succulent Tuna Tartare and Colorado grass-fed Lamb Chops (8000 Capps Ferry Road, Douglasville, GA 30135; www.FoxhallResort.com/food-drink). For adventurous foodies, Big Shots Kitchen & Bar is a new hot spot in Peachtree City that serves up uniquely South African dishes on beautiful tables made of reclaimed wood in an upscale, un-stuffy industrial-design atmosphere. The “Dish Not To Miss” is the Boboti Burger, made of lightly curried lamb and beef, with lettuce, tomato, bacon and South African banana; flavors that work extremely well together. Steak traditionalists favor the 30-day dry-aged Char-Grilled Bone-in Ribeye served with sautéed Swiss chard, sautéed potatoes and herb butter (102 Guthrie Way, Peachtree City GA 30269; www.facebook.com/Big-Shots-Kitchen-Bar-410824402683928). Those who say they like burgers, but think they are boring will eat their words when dining around Metro Atlanta. Just north of I-285 in Dunwoody, Vino Venue is known as Atlanta’s Wine School, not Atlanta’s Burger School, but they’re allowed to be great at more than one thing. The Vino Venue Burger serves up smoked wagyu beef, lettuce, tomato, onion, pickles and comeback sauce. Add Irish cheddar or a fried egg, and Cherrywood smoked bacon for even more flavor options (4478 Chamblee Dunwoody Road, Dunwoody, GA 30338; www.VinoVenue.com). Burgushi is burger meets sushi, an almost-unbelievable fusion specialty only offered at The Cowfish Sushi Burger Bar. It comes in various forms, shapes and sizes, each more intriguing than the last. The All-American Double Bacon Cheeseburgooshi wraps an all-natural beef cheeseburger and Applewood bacon in a soy paper and potato string sushi roll. You’ll believe it when you take one delicious bite (4400 Ashford Dunwoody Road, Dunwoody, GA 30346; www.TheCowfish.com). Seek after the best steak in Atlanta, and you’ll find it at McKendrick’s Steak House. Charred to perfection on the outside the inside remains tender and juicy beyond belief. Mr. McKendrick’s goal is to send every customer home saying that his steaks are the best they’ve ever had. He’s been meeting his goal now for 23 years (4505 Ashford Dunwoody Road, Dunwoody, GA 30346; www.Mckendricks.com). Now would be the time for some palate-cleansing gelato. Novo Cucina, a popular Italian eatery, combines the Italian gelato-making tradition with inventive American flavors. Made from scratch daily, 18 flavors range from year-round Italian staples like Pistachio and Stracciatella to Banana Pudding and Thin Mint. Leaving this Italian hot spot without having some gelato for dessert should be a crime (5592 Chamblee Dunwoody Road, Dunwoody, GA, 30338; http://NovoCucina.com). Alon’s Bakery and Market is known for many things–the fact that it’s a one-stop shop, their freshly baked breads and sandwiches, and European style sweets. From fruit tarts and chocolate truffles to irresistible French Almond macarons, everything is made in-house daily to the delight of visitors and residents alike (4505 Ashford Dunwoody Road, Dunwoody, GA, 30346; http://Alons.com). Secreto translates to secret–the secret art of incredible food. At Secreto Southern Kitchen & Bar, the menu is based on Chef Boyd’s secret family recipes that have been handed down, recreated and refined to create a sensory experience. While his fried chicken with smoked bacon jalapeno gravy is heavenly, save room for the Warm Buttermilk Glazed Carrot Cake for dessert. We’ll give away the secrets: Pineapple, coconut and pecans, cinnamon and nutmeg, topped with fresh sliced strawberries and a drizzle of warm orange cream cheese icing (6195 Windward Parkway, Alpharetta; http://SecretoKitchen.com). Just a short ride north on I-85, Gwinnett County offers welcoming, authentic Asian restaurants that are loved by newbies and natives alike. Super Pho serves everything from beef brisket pho to hot-n-sour seafood pho. Can’t get enough of these delicious noodle dishes? Try the Champion Bowl, equivalent to four bowls of pho that must be finished with no bathroom breaks. Winner gets a $100 gift card (3330 Satellite Blvd, Duluth, GA 30096; http://Superpho.menu). 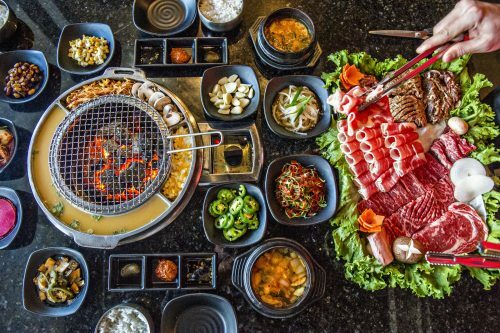 One of the popular stops on ExploreGwinnett’s Seoul of the South™ food tours, 9292 Korean BBQ offers a true taste of South Korea. The all-you-can-eat option is a generous sampler of several grilled meats and comes with traditional Korean side dishes (3360 Satellite Blvd #8, Duluth, GA 30096; www.facebook.com/9292KBBQ). Gwinnett County also offers a dazzling variety of notable “American” restaurants. For a creative twist on chicken and waffles, head to The Brunch Apothecary, where a cinnamon sugar churro waffle is topped with lightly fried chicken tenders, garnished with guava butter and sorghum syrup (2595 Fence Rd NE, Dacula, GA 30019; http://TheBrunchApothecary.com). For (literally) award-winning pizza, O4W Pizza was recently named one of the “Best Restaurants” by Atlanta Magazine. The Grandma Pie was recently featured in Bon Appétit Magazine (3117 Main St, Duluth, GA 30096; www.04WPizza.com). The must-try dish at Local Republic is the fried chicken. And, you’re in luck–every Monday starting at 5 p.m., you can get two pieces of perfectly-fried chicken with two sides for just $10. Pair it with one of the many local craft beers on tap (139 N Perry St, Lawrenceville, GA 30046; www.TheLocalRepublic.com). Named one of the “Best Seafood Restaurants” in Atlanta by Thrillist, you really can’t go wrong with any dish here. Having trouble deciding? The seared diver scallops are to die for (5260 Peachtree Pkwy, Peachtree Corners, GA 30092; www.NobleFinRestaurant.com). All around Metro Atlanta-north and south, east and west, create a tasting trail to suit your appetite and preferences. Visit the websites and map out some delectable delights; eat and repeat.